THIS HISTORIC B&B IS CURRENTLY UNDER RENOVATION … please check out these other Lynchburg Rentals. The Tolley House is the most storied Bed & Breakfast in Lynchburg, Tennessee. Originally, the estate of the daughter and son-in-law of Felix Waggoner Motlow and his wife, Finetta Josephine (Daniel) Motlow, this beautiful Greek Revival home has welcomed the most elite visitors to the area for more than 150 years. Felix was born April 9, 1838 right here in Lynchburg. On December 22, 1868, he married his lovely bride. Finetta, or Nettie as her friends and family called her, was the older sister of Jack Daniel, founder of Jack Daniel Distillery. They had ten children and remained together all the days of Nettie’s life. Following her passing on January 2, 1891, he never again married, even though he would live another 26 years. Among their ten children was their eldest son, a business prodigy, Lemuel Oscar “Lem” Motlow (born 1869), and their eldest daughter, Lillian Elizabeth “Lillie” Motlow, born a few years later (December 23, 1872). At the outbreak of the Civil War, Felix enlisted into Company E, 1st Tennessee Regiment, C.S.A., and served in that regiment in Virginia until the battle of Gettysburg. He was taken prisoner, July 1, 1863, in the ambush of Archer’s Brigade, and was in a Federal prison until the end of the war. The oldest of their ten children, Lem, replaced Jack Daniel as chief manager and eventually became the owner of the Jack Daniel Distillery in Lynchburg in 1907, when Jack, a very ill man at the time, ensured a smooth transition of his life’s work four years prior to his death. It is Lem who is credited with keeping Jack Daniel Distillery alive, by moving it to St. Louis, MO before 1910 when Tennessee Prohibition banned all alcohol sales and production in this majestic state a full decade before federal prohibition was enacted. It was also Lem who reopened Jack Daniel Distillery in Lynchburg immediately following the repeal of prohibition in Tennessee (federal prohibition began in 1920 and ended in 1933, Tennessee’s prohibition began in 1910 and didn’t officially end until 1937) making it the first registered distillery in Tennessee post prohibition (DSP-TN-1). Felix and Nettie’s first daughter, Lillie Motlow, fell in love with a wealthy land owner in Lynchburg. Although two years his senior, John Lafayette Tolley, was born into the wealthiest family in Lynchburg at the time. The hill where the Tolley House sits was just a portion of the land in the area he owned. His farm consisted of all the land your eye can see from this beautiful estate, on every side. There was so much land, the area became known as Tolley Town. Following their marriage on March 30, 1890, Lillie moved in with John and his family. As their own family began to grow, John and Lillie needed more space to themselves and all other family members moved to nearby homes (one of them, Jim Connor Tolley and his wife, Margaret moved directly across the street). 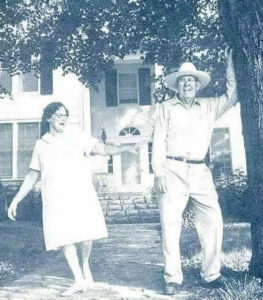 Their daughter, Lynne Tolley, has been a longtime spokesperson for Jack Daniel Distillery and can be seen regularly on Talk of the Town, a local station in Nashville, sharing stories and recipes from Jack Daniel Distillery and Miss Mary Bobo’s Boarding House. You’ll also see pictures of her if you go to Miss Mary Bobo’s for the best supper in town. The Tolley House Bed & Breakfast was the place John and Lillie called home for many years and raised their three sons. Among those sons, was Lem Tolley, who would become the third master distiller for his great uncle, Jack Daniel, at his storied Jack Daniel Distillery from 1941 to 1964. Lem Tolley married Ethel, a woman who would become known for her fierce independence and famous angel food cake. It became famous, in part, because Miss Ethel would use food die to match the icing on her cake to whatever else she was serving for high tea that day. No matter how many of her guests kindly asked for her famous angel food cake recipe, the answer was always the same: No. Ethel went to her grave with that angel food cake recipe, but while here at the Tolley House, you will enjoy a taste of the best homemade angel food cake Lynchburg has to offer every afternoon, along with some of the tea Miss Ethel was known to serve. Your mornings will begin with homemade muffins and a special blend of coffee made exclusively for Miss Mary Bobo’s Boarding House. Each Tolley House suite is named after one of our former residents. The Distiller’s Suite, formerly known as Lem’s Room, has a sweeping view of the green hillside with large picture windows around the majority of the room. Ethel’s Room has been recently remodeled to ensure the highest quality for your stay. The bathroom, however, with pink tile handpicked by Miss Ethel, remains the focal point of this suite. Upstairs, the Motlow Suite pays homage to Felix and Nettie’s history in this home, while the Compton Suite, shares the little-known story of Lem and Ethel’s son, John Compton Tolley, who moved to Hollywood and became a star. And what a handsome son of a gun that kid turned out to be. Original Hollywood posters and photos of John’s career are the highlight of this room. The Tolley House has long been a part of the Jack Daniel Distillery history, as well as the small town of Lynchburg, Tennessee. But this estate, nestled in the heart of town on Main Street, has a distinguished history of its own, one we know you will enjoy as you visit us and stay in any one of our elegant suites. And if you see someone passing you on the street, there is a very high likelihood it is a Tolley family member. At least four of Lem and Ethel’s grandchildren live within 2 minutes of the Tolley House.